Now your tree can have this special Marilyn Monroe and Elvis Christmas Ornament. 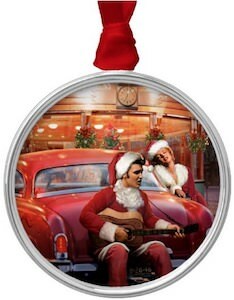 The holiday ornament is all about Elvis Presley and Marilyn Monroe and both are dressed up in red and white just like Santa Claus. Elvis is sitting on the edge of a red car while playing guitar while Marilyn is enjoying the music. The ornament we show you is round with a metal edge and a red string to hang it but if you like a different style then they are available too and you can see them all by clicking on the picture. A Christmas can now have this nice classic looking ornament. If you like want a cool Elvis mug for your morning coffee then come see this Elvis guitar handle mug. 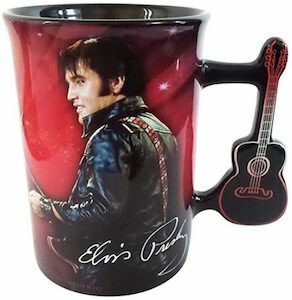 The mug is black and red in color and has a handle that is a guitar and on the mug itself you can Elvis Presley and his autograph and the back of the mug shows his name in big letters. The Elvis Presley mug is 16 oz and is not dishwasher or microwave safe so hand wash only. A nice mug like this is great for yourself and make for a nice present too and the mug comes in a pain white box to make it into a surprising present. Now there is a 2019 Elvis wall calendar! 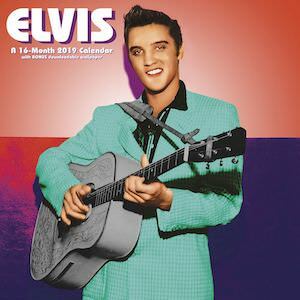 If you like Elvis Presley and have space on your wall then a calendar is a great way to fill that spot and this Elvis wall calendar would be amazing on your wall. Inside the 2019 calendar you will find amazing picture of Elvis Presley and every month will have something new to offer. And beside the great images there is a great calendar to with plenty of space to fill out important date like birthdays and thinks like that and the Elvis calendar already has all the major holidays filled out for you too. If you are an Elvis Presley fan and would like him on your couch then you should check out this green Elvis pillow. The throw pillow has a green background and on top of that you an see Elvis just lounging and looking at you. 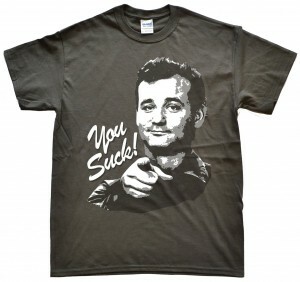 And yes the same Elvis Presley picture can be found on both the front and the back. The Elvis pillow is square and comes in many sizes going from 16 all the way to 24 inch and they make an indoor and an outdoor version. 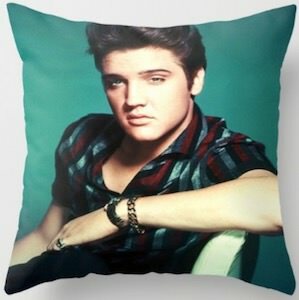 So adding Elvis Presley to your home decor is easy all thanks to this great looking pillow. Now there is an Elvis Blue Hawaii beach towel that brings back memories to that classic movie with Elvis Presley in it. 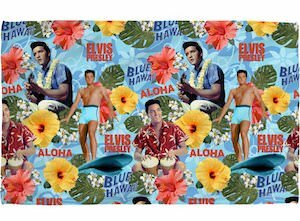 On the beach towel you can find a light blue background and on that, you will many hibiscus flowers and Elvis making music and surfing as the character Chad Gates just like you can see him do in the Blue Hawaii movie from 1961. The Elvis Presley towel is 30 x 58 inches in size and is printed on one side. A towel like this is great for when you are at home taking a shower but works great at the beach too and maybe it makes you think that you are at a beach in Hawaii. This Christmas you won’t have ugly drink marks on your table thanks to this coaster with Marilyn Monroe and Elvis Presley on it. The coaster comes in a set of 6 and shows Monroe and Presley in Paris with the Eiffel Tower in the background and many Christmas details fo make it all perfect as part of you holiday decorations. And the Christmas coasters are 4 x 4 inches and will look stunning on the table and people will comment on how special they are. Invite Elvis Presley and Marilyn Monroe to your home this Christmas in the form of these fun Christmas coasters. This year your Christmas tree can have Elvis Presley in it all thanks to this tree ornament that looks so much like the King. The ornament shows Elvis while holding a microphone and he is wearing a white suit with blue details and that will make his look stunning around those green tree branches. So if you like the music of Elvis and are a big fan then an ornament of Elvis Presley is what you really need and then you just have to play some Elvis Christmas music to make this holiday season a success. If you want your baby to enjoy Elvis as much as you do then you need to get them this The King bodysuit. On the light blue snapsuit, you can find a worn looking image of Elvis Presley and on top of that it says “The King” which he was. You can get this Elvis Presley bodysuit in sizes 6 – 24 months and it is made from 100% preshrunk cotton. 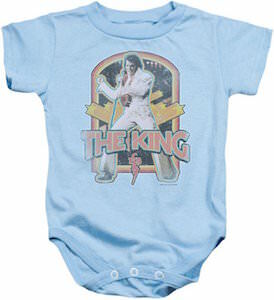 Bring the love for Elvis to even the littlest people by dressing them in this amazing The King bodysuit. 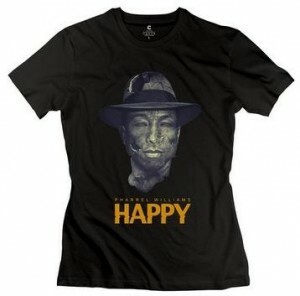 This women’s dress shows a great image of Elvis on the front while he is playing guitar. 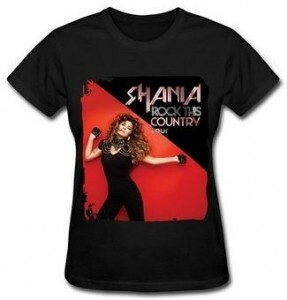 This is a t-shirt styles dress with short black sleeves and a black back and the front is white with on it a nice black and white photo of Elvis Presley and his guitar and that image takes up most of the front of the dress. 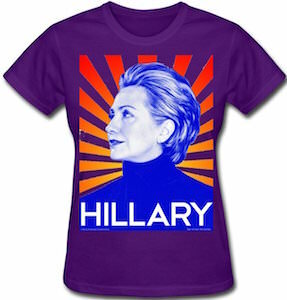 If you like Elvis and want a fun and comfortable dress then this is what you really need. You can get this Elvis Presley dress in women’s sizes XSmall – 2XL for that perfect fit you want. 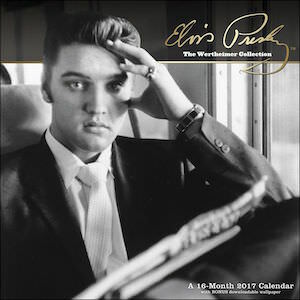 Now you can start enjoying amazing photo’s of Elvis Presley as this 2017 wall calendar has some amazing black and white photo’s of Elvis. This calendar is filled with photo’s made by Alfred Wertheimer and that is why this calendar is called “Elvis The Wertheimer Collection Wall Calendar”. Each month in 2017 you will find another amazing photo taken by Alfred of your favorite star Elvis and there is a calendar overview from September – December 2016 making this a 16 month calendar. And as you calendar is not always visible they added a free downloadable wallpaper so that you can have Elvis on your computer to.